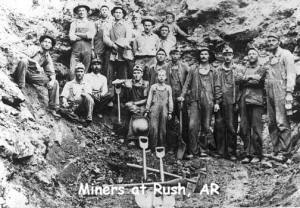 In the 1880s farmers on Rush Creek discovered zinc ore, and soon the "rush" to Rush began. Claims were staked out along the Rush Valley and that of neighboring Clabber Creek. By the 1890s the mining boom was well established and miners and investors arrived from all over the country. 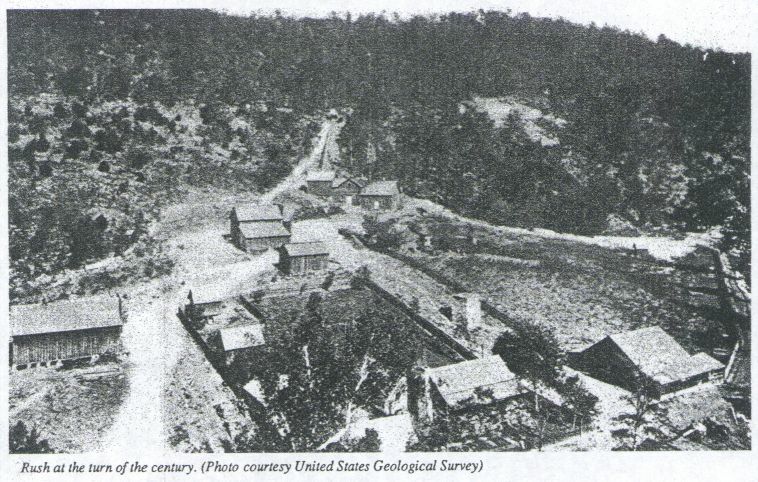 The most famous mine at Rush was the "Morning Star," which awed observers with its quarry-like production of ore. Around the Morning Star Mine, a community of homes and businessess developed. This community endured until the 1960s. 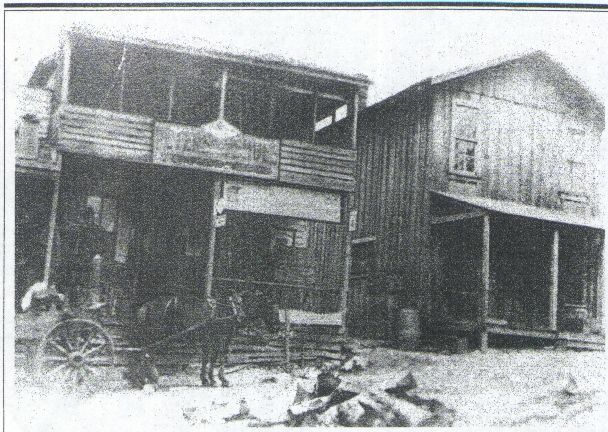 The heyday of the mining district came during World War I. All of the mines were in full operation, producing zinc for the war effort. As the war wound down, so did the mining. Soon the valley seemed a ghost town in comparison to the busy years of several thousand inhabitants. A mining revival in the 1920s was short-lived, but free-oreing supported local miners until World War II. During the 1940s several of the processing mills were dismantled for salvage. Until the closing of the post office in the 1950s, Rush maintained a community identity. Gradually, the remaining inhabitants left, until Rush became known as a ghost town. 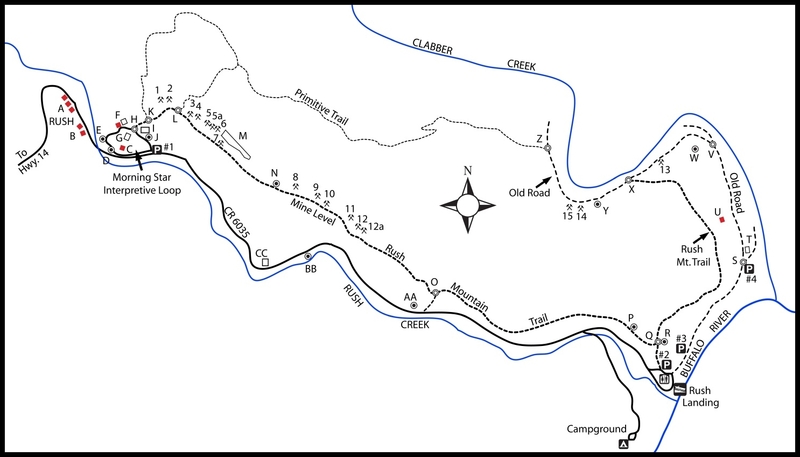 Today the Rush mining district is part of the Buffalo National River. 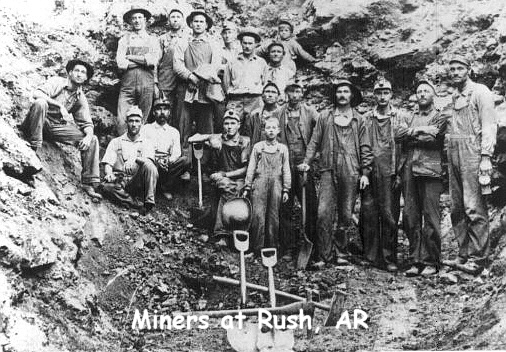 Rush is entered on the National Register of Historic Places as a significant site in history of mining in northern Arkansas. Sign in front of Miners House "B"
a large opening mining area. 36.12748°, 92.55782° "P" Area of a large area of tailings. below here on Rush Creek. it was once a priviate mining operation?